Make-A-Wish Shanghai was launched last June to achieve the dreams of children or young adults suffering from serious diseases. Jerry Huang, chairman of the Make-A-Wish Shanghai Charity Foundation , looks at Dingding and her father when they share her wish story in Shanghai Thursday afternoon. Seven children and young adults suffering from life-threatening diseases have realized some of their dreams thanks to a charity foundation. “Make-A-Wish Shanghai” was launched last June by Walt Disney, Ferrari China, AIG China and Shanghai Peninsula Hotel to grant wishes to children with serious diseases — to bring them and their families hope, strength and joy as they fight the illnesses. "We believe that, when a wish comes true, it deeply inspires these wish-kids," said Jerry Huang, chairman of the foundation. "That inspiration is shared among their family members and builds hopes and courage in life." The first batch of beneficiaries includes a 5-year-old Chinese girl nicknamed Dingding, who is suffering from leukemia. Her wish was to dress like Elsa, royal heroine of the Disney animated film Frozen. And so she did when she met Elsa at Shanghai Disneyland last September 18. “I was extremely touched when I saw my daughter hugged with Elsa at the entertainment park after the staff dressed her up like the fictional queen,” said the girl’s father Cai Jianhua. Cai said there were seven volunteers and Disney staff members accompanied Dingding when she visited the park to enjoy her dream visit. “I could not help thinking that if the disease is the poisonous apple given to her by God, they are the seven dwarfs escorting her and one day she will meet her prince,” he said. Nineteen-year-old Paulina Georgia Xanthakos, who comes from Poland and has brain cancer, also had her wish come true. She was invited to Shanghai to watch the Victoria's Secret Fashion Show and attend the party afterwards last November. A 6-year-old Chinese boy suffering leukemia managed to meet his favorite Japanese cartoon character Ultraman Orb played by a Chinese volunteer. He was also presented with autographs from the Japanese actors playing the cartoon characters. 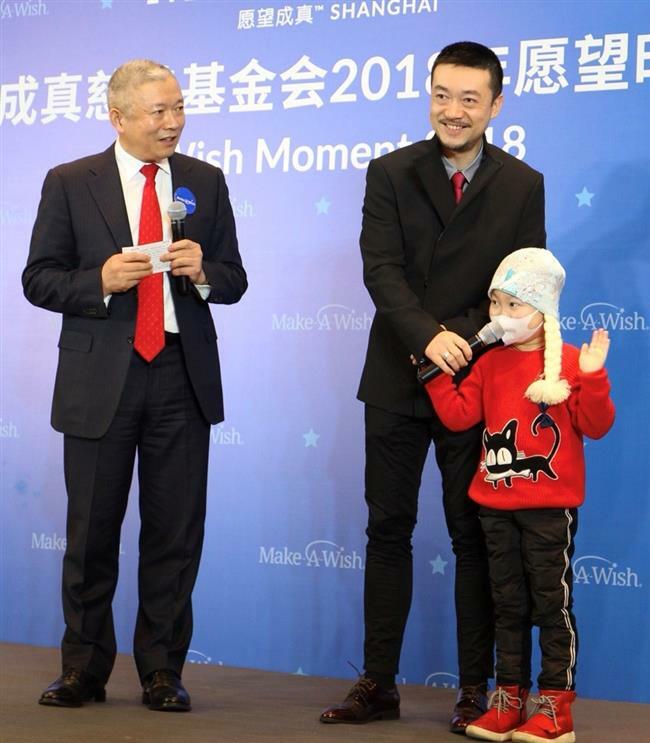 Zhu Jie, chief executive of Make-A-Wish Shanghai, said 35 volunteers had joined the charity organization and a further 50 would be interviewed and trained this weekend. She said the foundation is aiming to grant wishes to 40 children this year, including a sick child who wants to ride in a racing car and she added that Ferrari officials are now preparing to help to make that dream come about. “It’s an honor for all volunteers in the organization to make the wishes of kids with serious illnesses come true and it’s our wish that they recover soon and grow up healthily,” said Eric Zheng, chief executive of AIG China.